Apple has quickly jumped the number towards iOS 10 development as iOS 9.3.5 update is now rolling out to qualifying devices. This happens to be unexpected release for iPhones, iPads and iPods. In terms of Apple words, this release was quick because it includes some important security vulnerabilities. Bill Marczak and John Scott-Railton from The Citizen Lab reported that an iOS security bug makes NSO Group, an Israeli Surveillance software company to read text messages and emails of journalists and government officials. This iOS software bug allowed them to easily track their locations, FaceTime calls and phone calls as well. This company send out text message with a link and anyone who clicks on it, makes sophisticated malware installed after jailbreaking it. 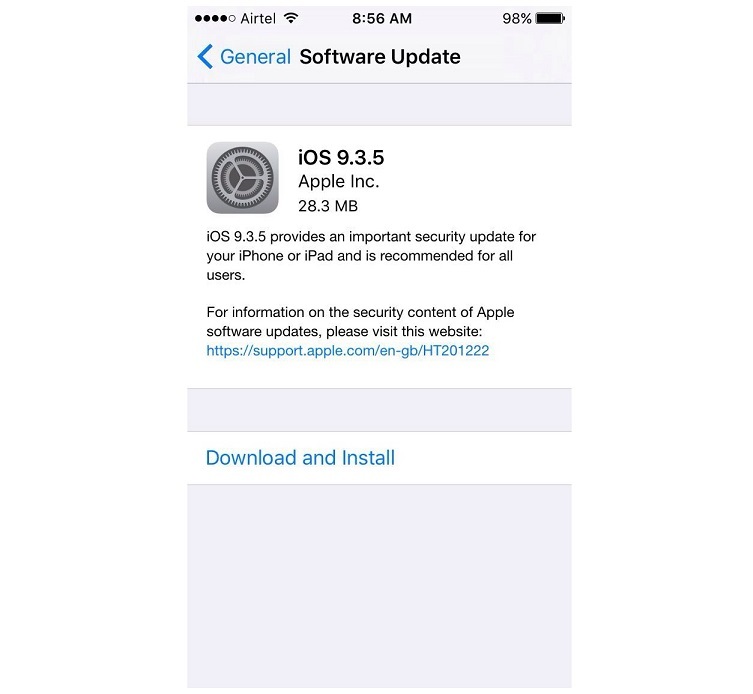 Apple says that this is a recommended update in order to keep your device security intact. You can read full details regarding this update on Apple site. This iOS 9.3.5 update happens to be a very small one indeed. It’s an Over the Air update costing around 28 MB. The file size may vary depending upon your device model. You should receive an update notification but if you haven’t then you can request for OTA by going through Settings > General > Software Update and t hen Choose “Download and Install”.